Cecil Gant was a boogie-woogie pianist and R&B vocalist who toured during the 1930s but came to prominence in 1944 when he scored a No. 1 R&B hit with “I Wonder” while still in the US Army and was performing and recording as “Private Cecil Gant – The G.I. Singsation” while appearing at Government Bond rallies. He went on to score several more Top 10 R&B hits during the late ‘40s until his premature death in 1951 from pneumonia at the age of 37. 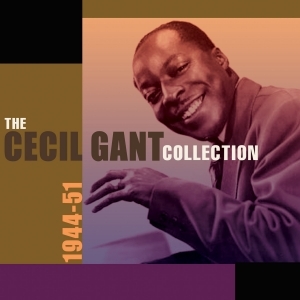 This excellent-value 52-track 2-CD collection selects from his prolific recording output during those hectic seven years for the Bronze, Gilt Edge, Four Star, Downbeat, Bullet and Decca labels, his work encompassing pure boogie-woogie through to jump blues and sentimental blues-inspired ballads, often in the semi-spoken style reminiscent of Fats Waller established by “I Wonder”. He was a highly individual and distinctive performer, and he occupies a unique niche in the annals of post-war R&B and blues – this anthology will certainly interest those looking to build an eclectic collection of recordings across the genre.